I've been reading Ernest Hemingway's For Whom The Bell Tolls. I haven't done a review of it yet; I haven't finished it yet, but I'm enjoying the read and I see why it's a classic. There's much fodder for thought in it that I'll treat in future journal entries, and maybe Dillon can pair it with a good Spanish wine. 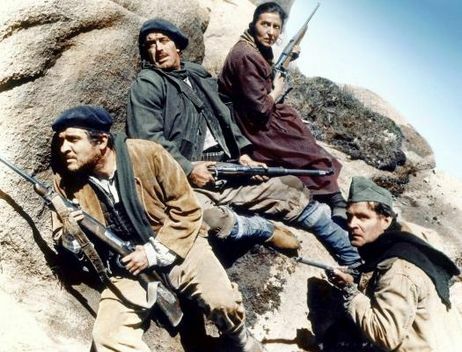 The book is set during the Spanish Civil War (1936-1939) and one theme in it is the role of courage among the partisans fighting the fascists (corporate powers who were the "rebels" in this war). In chapter 34 a partisan fighter, Andres, is musing over his own courage. He has taken on an assignment as messenger that he could use to avoid the upcoming battle. It reminds him of the times in his youth when he would be glad of seeing it rain so that his village's bull-baiting event would be canceled and he wouldn't have to participate in that dangerous "sport." In deciding whether to tarry in delivering his message, he considers how fate has placed him in this situation, where he must be brave and risk death, when he would rather be living a peaceful, normal life. I've had similar thoughts and the conflict has kept me from getting too political or activist in this journal. After all, my desire is to write fiction--stories that excite emotions and imagination, and that inspire thoughtfulness. I've tried to do that in what I've put out and, so far, it's been well received. But taking a stand for anything, can be polarizing and risky. In the last few weeks I've had some positive feedbacks that have been encouraging. The "Wine & Lit" journal entries I've done with my son, Dillon, have been well received and opened my "network" to new readers. I also expanded my network to people who liked Ben Stiller's Walter Mitty movie and who also liked my journal entry about it. All this has brought more visits to my website and more downloads of my stories. It has even led to all my stories on Barnes and Noble being rated and reviewed quite positively. I'm very grateful for all this and it encourages me to carry on with my other projects, especially the first Dentville novel. These projects include a short story I have in mind, and a novella (possibly novel) that I really want to do. I want to revamp my website and do a newsletter of some sort. I want to continue the Wine & Lit journal entries and evolve them into something. But all this is not being done in a place of sunshine with unlimited potential. I work in a shadow, as we all do, that grows darker by the hour. That darkness comes from the same evil that the partisans of the Spanish Civil War fought. In that time, the enemy was simply "the fascists," and we think of them as Franco and Hitler and Mussolini. But those were just agents of a larger evil that seeks to own the earth and every thing in it--from people to the smallest microbe and even the weather. To the larger evil, the cosmos is just a collection of commodities to be consumed to the final dregs. In the mid twentieth century, there were boundaries on this evil. You could get away from it and define life as your space and its space. If you wanted to fight the fascists, you had to go to Spain. Today, there are no such boundaries. The struggle of the good against this great evil has come to our time as a final great battle called, Collapse. I mean by this the collapse of industrial civilization because it operates on principles that are self-destructive and unsustainable. These principles include the idea of "infinite growth," hierarchy ("I'm the boss and therefore am better than you! "), privilege, materialism, militarism, and sheer greed. Evidence of the working out of these principles is seen in the endless push for more and greater wars, and in exploiting the natural world for profit to the point that our oceans are nearly lifeless and our planet's atmosphere is poisoned and shredded. I see evidence of the latter every day. Aircraft are constantly plying the sky and leaving horizon-to-horizon trails of chemical death for the sake of weather control. There are no longer clear skies, only varying degrees of haze. Clouds are flattened, ragged, and nucleated with particulates to drop rain and snow when and where directed. This is geoengineering and it is NOT something "being considered" to fight global warming. It has been going on for years for the sake of using weather as a weapon, and it has been ramped up to a fury over the last year. The working of geoengineering is obvious (just observe the skies) and the evidence for what they are doing is solid. So I cannot carry on without acknowledging this fight that is going on all around us. I cannot just live in the delusion that provides comfort to so many around me. If you understand what I'm saying and want to take the risk of stepping out-of-doors into reality, then I suggest you read the primer at this link. But I must warn you: this material is very, very hard to take, but I believe it to be true. I think that we are born into a time of great difficulty, he thought. I think any other time was probably easier...But it is a time of difficult decisions. The fascists attacked and made our decision for us. We fight to live. I intend to carry on, to the best of my ability, with the literary work I've started here. It is my passion and I can't not do it. But in my work, I want also to raise the awareness of those who take interest in it, and fight the fight that is brought to us. Stopping geoengineering is the battle we must win, as partisans for the earth and humanity, or else no one will win anything, ever again.